#10/11 Terriers return to Conference action tonight, hosting longtime rival Northeastern in the first of a home-and-home series. 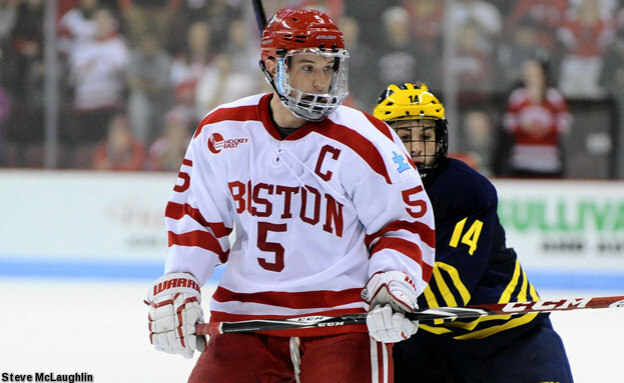 Puck drop at Agganis Arena is at 7:30 p.m.
Coming off its 5-4 overtime win against Denver, BU will be bolstered by the return of captain and first-team All-American defenseman Matt Grzeylcyk, who has recovered from off-season knee surgery. The Charlestown native and Bruins draft pick, who scored a career-best 38 points (10G, 28A) last season and led all Hockey East defensemen in points (20, for conference games during the regular season), will be paired with freshman Charlie McAvoy, according to the Daily Free Press. The other blueline pairs: sophomores Brandon Hickey and Brandon Fortunato, and junior Doyle Somerby with sophomore John MacLeod. With pre-season All-American Kevin Roy off to a slow start, the Huskies’ offense is being led by junior John Stevens and his brother, sophomore Nolan Stevens, with four and three goals respectively. Junior Zach Aston-Reese has five points. Junior Derick Roy and freshman Ryan Ruck have split the goaltending job. Tonight is Military Appreciation Night. In conjuction with Operation Hat Trick, the first 150 veterans or active military personnel who go to the Agganis Arena Ticket Office will receive a free ticket and cap courtesy of Military.com. After the 150 tickets have been claimed; tickets with a military ID will be just $10. One NHL scout from a Western Conference team at the BU-Merrimack game on Friday texted me to say that JFK [freshman Jakob Forsbacka-Karlsson] was “the best player on the ice”, passing on that the Bruins scouts really might have outdone themselves with the picks the team got from Calgary- Zach Senyshyn, JFK and Jeremy Lauzon. Kieffer Bellows scored a goal and Clayton Keller earned Best Player for the US honors as Team USA edged Sweden in the Five Nations Tournament in Monthey, Switzerland. Bellows has eight goals in his past seven games and 13 in 14 games overall. Keller, who centers the team’s top line, assisted on Team USA’s first goal. Next opponent is Finland on Saturday. 2017 recruit Hank Crone has been traded from USHL Omaha to the Fargo Force, where he’ll be reunited with Coach Cary Eades, who coached in him the 2014 Under 17 Five Nation’s Tournament. Crone had scored two goals and two assists in 12 games for the Lancers. Jack Eichel used a strong offensive-zone move to rifle home his fifth goal of the season, but it was the Sabres only goal as they fell to Tampa Bay, 4-1. Eichel accounted for 6 of Buffalo’s 31 shots. The Boston Herald spoke with longtime Bowdoin Coach and former BU standout and co-captain Terry Meagher, who announced plans to retire at the end of his 33rd season behind the Polar Bears’ bench. Meagher, whose younger brothers, Rick Meagher and Tony Meagher also starred for the Terriers, was interviewed for this week’s episode of Inside BU Hockey. Terriers begin a split home-and-home with Boston College on Saturday, hosting the Eagles at Walter Brown Arena. 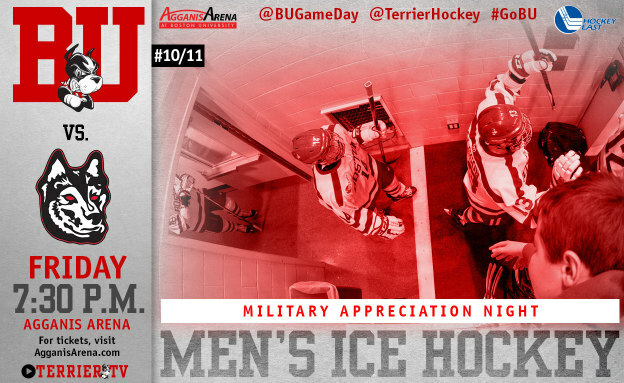 The contest is BU’s Military Appreciation Game, which is being marked with a free ticket offer. For their hard work and commitment to service, the offer is open to all active and retired members of the military and their guests or anyone in the BU Community as well. Order tickets here.